During the month of May a wide range of second hand books are on sale at the back of St. Margaret Mary. The purchase is simple: make a donation and take as many as you want - if you don’t want any, then make a donation and then take some to a charity shop. Funds raised will go towards helping Will and Robbie meet their costs for the Diocesan Pilgrimage to Lourdes. There were 68+62+102 = 232 at Mass last weekend. Thank you for your offering of £327.20 + £233.61 = £560.81. We welcome back Fr Norman for the next couple of weekends. 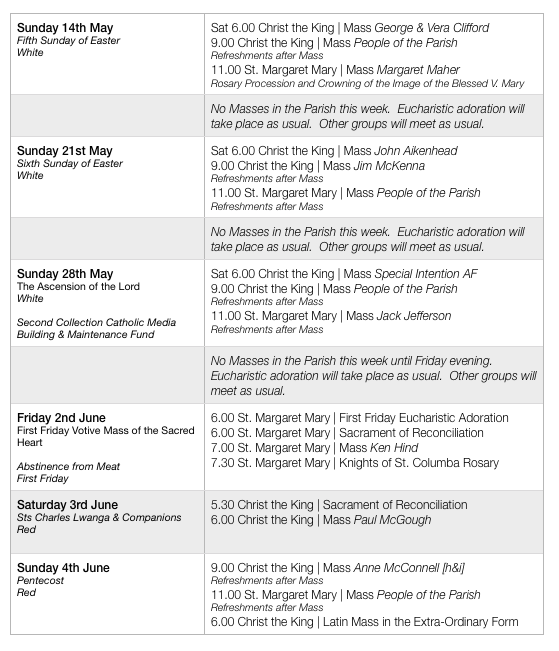 Fr Michael is away until Friday 2nd June. If you require a priest in an emergency, please contact the dean, Fr Jim Allen at St. Bede’s on 521704. QUARR ABBEY: Monastic Experience Weekend for Catholic men 18-35. An opportunity to sample monastic life in the Benedictine tradition. Friday 2nd to Sunday 4th June 2017. novicemaster@quarr.org. A website offering a helping hand to those grappling with issues around death & dying. Based in the Catholic tradition, but open to all, it features real-life stories about dealing with the journey through death to eternal life. Visit: www.artofdyingwell.org. There will be a Rosary Procession and crowning of the image of Our Lady after Mass at St. Margaret on Sunday 14th May to mark the centenary of the Apparitions of Our Lady of Fatima. Northern Star Travel have a group booked to travel to Lourdes by coach, which co-insides with the Lancaster diocese. They currently have 14 places available. Lourdes by coach departing from Preston 20th July for 10 days, no overnight travel, staying at the 4* Hotel Paradis Lourdes at a cost of £600 per person sharing, £775 in single room. For further information, please contact Ged Conroy on 01772 728071 or Northern Star Travel on 0161 773 2115. Bishop Campbell has asked that weekday Mass times in other churches be published in newsletters, especially if a priest is going to be away since ‘Eucharistic Services’ are not permitted during the week. This event has been CANCELLED due to circumstances beyond their control. They apologise for any inconvenience and disappointment caused. They will let you know when they are holding our next event. Cor et Lumen Christi Community, Wigton. There will be another ‘intensive’ viewing of this powerful series on Saturday 17th June 2017 between 11.00 am and 4.30 pm for those unable to attend previously. Sign up in coming weeks. Please note that the date has changed due to a diary clash. Cantonelle Ladies Choir will perform a concert in St Augustine’s church, CA3 9JU on Friday 9th June at 7.30 pm. Entry is free, but donations to Carlisle Key will be welcomed. If you feel called to the priesthood, contact the Vocations Team. If you are over 21 contact Fr. Darren Carden 01229 471405 or 07552 795060. Negotiations continue regarding a new site for Newman School. Please pray through the intercession of St. Joseph and Blessed John Henry Newman that these negotiations are successful. Perhaps pray your daily rosary for this intention? There were 77+64+101 = 242 at Mass last weekend. Thank you for your offering of £441.86 + £253.50 = £695.36. Thank you also for Building Fund contributions of £261.50 + £116 = £377.50. Our Lady of Furness, Barrow is seeking to employ a committed practising Roman Catholic as a Parish Outreach Worker. The role will be primarily to support, develop and implement the parish mission in all aspects of the Gospel. The post is for 21 hours per week with a salary of £10,952.00 pa. For more info, please call: 01229 820210 or email: office@olof.org.uk. Closing date Thursday 4th May 2017. The Holy Rosary will be recited after the celebration of each weekday Mass during Lent. 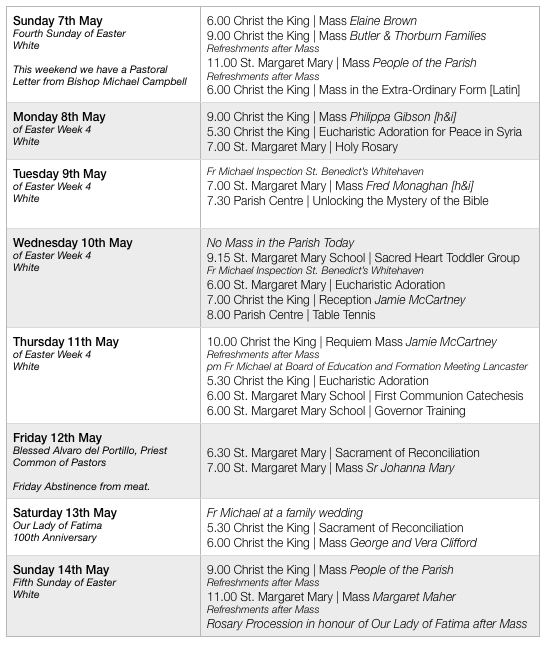 There will be a Rosary Procession and crowning of the image of Our Lady after Mass at St. Margaret on Sunday 14th May to mark the centenary of the Apparitions of Our Lady of Fatima. Northern Star Travel have a group booked to travel to Lourdes by coach, which co-insides with the Lancaster diocese. They currently have 14 places available. Lourdes by coach departing from Preston 20th July for 10 days, no overnight travel, and staying at the 4* Hotel Paradis Lourdes at a cost of £600 per person sharing, £775 in single room. For further information, please contact Ged Conroy on 01772 728071 or Northern Star Travel on 0161 773 2115. The next date is Saturday April 29th. To be held at St Edmund’s Church, Orton Rd, Carlisle. All welcome. Renewal days start at 11.00 am and finish around 4.00 pm. Please join us even if you cannot stay for the full day. Tea and coffee provided but please bring a contribution to a shared lunch. For further information, please contact Janice Wrench on 01768 868489. ENCOUNTER - Experience the loving presence of Jesus on Sat 20th - Sun 21st May 2017 at Cor et Lumen Christi, Wigton, CA7 9HU - DONATION ONLY EVENT. All welcome. There will be another ‘intensive’ viewing of this powerful series on Saturday 10th June 2017 between 11.00 am and 4.30 pm for those unable to attend previously. Sign up in coming weeks.